Hanoi will host European-Vietnamese Dance Days themed ‘Europe meets Vietnam in Contemporary Dance’ at the Youth Theater from September 28-29. Three contemporary dance performances will be presented to audiences in different dance traditions, themes and artistic expressions of Belgium, Germany and Vietnam. The solo dance piece ‘Lamento’, telling of a deep pain of love, will be performed by dancer Gabriella Iacono under the Belgian choreographer Michèle Anne De Mey. The German work titled ‘Get the Revolver” is a story of a woman who suffers from dementia at the end of her life and is sunk in a dream world which gradually dissolves her personality. The solo dancer Brit Rodemund was awarded the title ‘Dancer of the Year’ in Germany for the piece choreographed by Helena Waldmann. 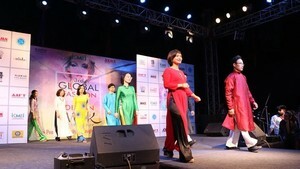 Vietnam’s dance performance will be presented by the young dancers of the Vietnam National Opera and Ballet. German and Belgian choreographers Helena Waldmann and Michèle Anne De Mey will give an exchange on their dance pieces, video-clips of their earlier works and answer questions from the audience at the Goethe Institute on September 30.